Non-classical light is light that has characteristics described through quantum mechanics and not using real world or classical properties. One type of non-classical light is squeezed light. Squeezed light put simply is light that is manipulated in the quantum level through the generation of photons. Since the number of photons in a beam of light is random, squeezed light is generated with a steady number of photons in the beam. It can be said that the number of photons travelling in the light beam from squeezed light is a constant. The result of using squeezed light is that quantum noise (random fluctuations in the wavelength) is reduced significantly. This makes measuring distance and targets more precise. Also with less noise, transmitted signals are clearer. Since the photons are constant in squeezed light with minimal quantum noise, any fluctuations recorded are from outside source and not a result of that noise. Applications for squeezed light range from using it for communication (fiber optics), measuring distance, and detecting gravitational waves. 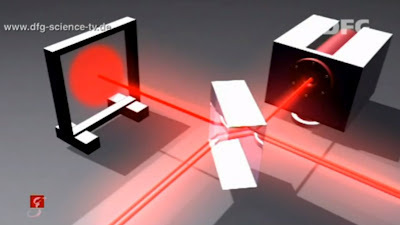 It is also being used in quantum cryptography where code keys are transmitted via squeezed light. An international team of physicists has pushed the boundaries on ultra-precise measurement by harnessing quantum light waves in a new way. It is one thing to be able to measure spectacularly small distances using "squeezed" light, but it is now possible to do this even while the target is moving around. An Australian-Japanese research collaboration made the breakthrough in an experiment conducted at the University of Tokyo, the results of which have been published in an article, "Quantum-enhanced optical phase tracking" in the prestigious journal, Science. Leader of the international theoretical team Professor Howard Wiseman, from Griffith University's Centre for Quantum Dynamics, said this more precise technique for motion tracking will have many applications in a world which is constantly seeking smaller, better and faster technology. "At the heart of all scientific endeavour is the necessity to be able to measure things precisely," Professor Wiseman said. "Because the phase of a light beam changes whenever it passes through or bounces off an object, being able to measure that change is a very powerful tool." "By using squeezed light we have broken the standard limits for precision phase tracking, making a fundamental contribution to science," he said. "But we have also shown that too much squeezing can actually hurt." Dr Dominic Berry from Macquarie University has been collaborating with Professor Wiseman on the theory of this problem for many years. "The key to this experiment has been to combine "phase squeezing" of light waves with feedback control to track a moving phase better than previously possible," Dr Berry said. "Ultra-precise quantum-enhanced measurement has been done before, but only with very small phase changes. Now we have shown we can track large phase changes as well," he said. Professor Elanor Huntington from UNSW Canberra, who directed the Australian experimental contribution, is a colleague of Professor Wiseman in the Centre for Quantum Computation and Communication Technology. "By using quantum states of light we made a more precise measurement than is possible through the conventional techniques using laser beams of the same intensity," Professor Huntington said. Curiously, we found that it is possible to have too much of a good thing. Squeezing beyond a certain point actually degrades the performance of the measurement making it less precise than if we had used light with no squeezing."